Cho, Raili, Jane and Greg after their interview in Loglogo. We are partnering with the International Centre of Social Franchising (ICSF) to help us work out the best way to scale our impact. Raili Marks and fellow ICSF team members recently visited the field to get a firsthand insight into how the BOMA Project works. Below is an account of Raili’s experience. These 14 women representing 5 businesses from the neighboring villages have met once a month for the past year and a half to do just this: deposit shares, give loans, take loans, and receive ongoing training on how to manage their enterprises. 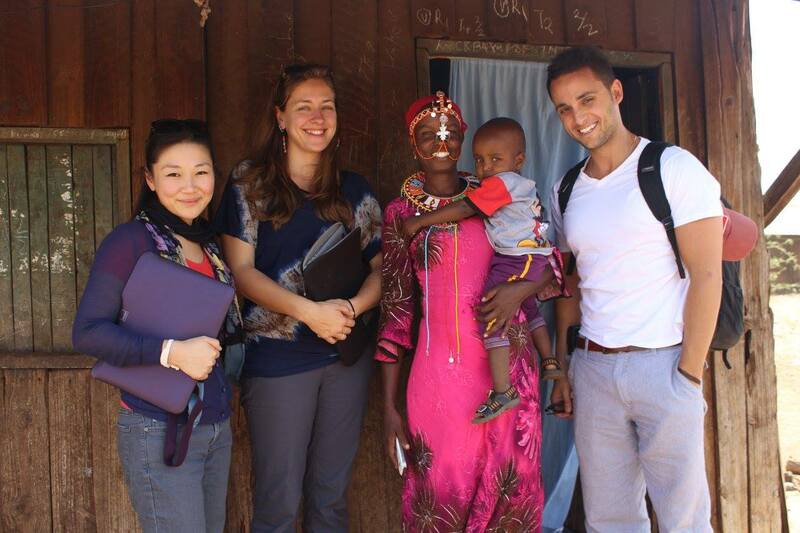 We are visiting one of The BOMA Project’s savings and loans groups in the arid lands of rural northern Kenya. ICSF and The BOMA Project (BOMA) have been working together for the past few months to develop the strategy and model to scale BOMA’s poverty graduation intervention – the Rural Entrepreneur Access Project (REAP) – to new geographies. cash flows, and inadequate financial services for the rural poor. Profits from each REAP business provide a new and diversified income, while BOMA savings associations help women to manage cash flow (for daily needs), plan for future expenses (such as school fees and medical care), and respond to shocks (such as drought or family emergencies). Meanwhile, interest-bearing loans offered by BOMA savings associations are often the first—and only—source of cash and credit in the community, serving as an informal village bank. As part of ICSF’s process, we are in Kenya to observe the program in action; conduct interviews with staff, program participants, and other stakeholders; and gain an in depth firsthand understanding of operations and the model. Since 2009, BOMA has enrolled over 11,500 women, launched over 3,600 businesses, established 670 savings groups, and directly impacted over 69,000 women and children. It is clear to me as I watch the money and smiles flow around this savings group that BOMA’s model is unmistakably having impact. Those of us in the social sector often wonder what’s in the “secret sauce” that drives impact in an organization. At ICSF when we work with our clients to assess the “core” of their intervention – or all of the actions essential to achieving impact that should be replicated in new locations – we evaluate not only what is done (the intervention process) but also how it’s done (the systems and structure surrounding the process that make it effective). The “how” can encompass the values of an organization, the staff, the training, the systems, tools, and technology brought to bear. It’s not just what you do, it’s how you do it.